Flavoured black tea. An exceptional blend of fine teas, enhanced with subtle Bergamot notes. 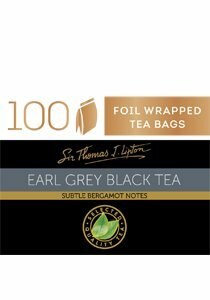 Now when drinking LIPTON'S Earl grey Tea, you are doing more to support tea growers and the environment. Already 100% of LIPTON'S Earl Grey Tea comes from Rainforest Alliance Certified farms. To learn about LIPTON'S commitment with the Rainforest Alliance for better social, environmental and economic conditions for tea growers visit www.rainforest-alliance.org.